If you’re tired of spending half your income on rent, or dropping $4.50 on a gallon of milk, it may be time to find a cheaper place to live. So where should you go? Your best bet is the Midwest or the South: 7 of the 20 cheapest cities in America are in a Midwestern state, and 8 are down south (11 if you include Texas). Places like Springfield, Missouri and Knoxville, Tennessee might be perfect for people looking to save money or get out of debt. On the other hand, if you’re seeking an affordable lifestyle, you’d be wise to avoid the West Coast, as 7 of the 10 most expensive cities in the country are in either California, Washington or Hawaii. The other three are on the east coast. Check out SmartAsset’s index of the Most Affordable Housing Markets in California. To find the cheapest places to live, SmartAsset used data from our Housing Market Affordability Index, rent data from the US Census Bureau and cost of living data from the Council for Community and Economic Research, which includes things like the price of ground beef and the cost of shopping for clothes. We combined those factors, giving 50% weight to housing (rent and monthly mortgage payments) and 50% weight to everything else, to generate a single cost of living index–100 is average, so below 100 is cheaper than average. Since small towns are almost always less expensive than cities, we only considered places with populations exceeding 150,000 in our analysis. Buffalo has always been torn between the East Coast and the Midwest, but when it comes to living expenses, it has more in common with its land-locked neighbors than with those on the Atlantic. The median monthly rent in Buffalo is just $512—that’s one dollar less than median rent in Cleveland, but less than half the average rent on a New York City apartment. 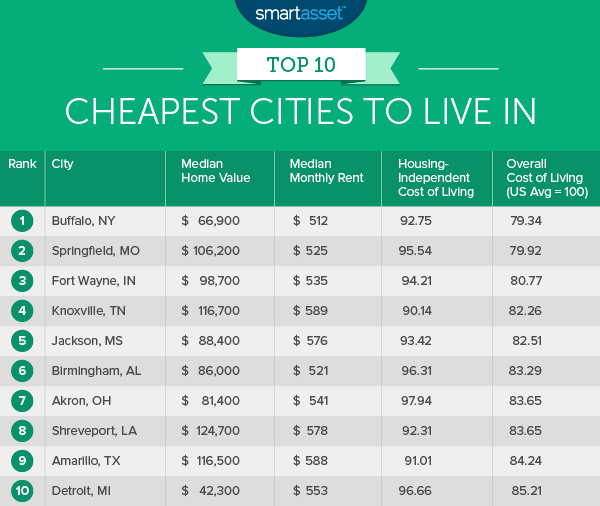 According to the U.S. Census Bureau, the median home value in Springfield is $106,200, higher than six of the other ten cheapest US cities in our study. However, thanks to lower-than-average property taxes, among other factors, the median monthly home payment in Springfield is just $905 a month, lowest of any major city in America. That’s a bargain for anyone who wants to own a home on a budget. Located in northeast Indiana, not far from the state’s borders with Michigan and Ohio, Fort Wayne was originally the site of a U.S. Army fort, built by Anthony Wayne in the years following the revolutionary war. While living in the city today probably isn’t quite as cheap as it was back then, it is hard to beat Fort Wayne’s median monthly rent of just $535. Allen County, in which Fort Wayne resides, is also one of the 100 cheapest counties for closing costs in America (out of over 3,000). College students, who often don’t have any income, are famous for finding ways to save money. Whether that means living off the free food that is offered at campus events, or building a wardrobe out of apparel from the lost and found, some students will never give up a chance to save a penny. In Knoxville, however, students may not have to stoop to those lows. According to the cost of living website Numbeo.com, a pint of beer costs just $2.50 in the average Knoxville restaurant. That’s a price any undergrad can appreciate. According to the cost of living data aggregator Numbeo.com, a loaf of bread in Jackson costs just $1.55, compared with $2.70 in New York City. So you can count on cheap sandwiches in Jackson, but what about housing? Well, that’s pretty cheap too. Average rent in the Mississippi state capital is just $576. With a population of just over 212,000, Birmingham is the largest city in Alabama, but its population has been falling in recent years. In fact, the city is only about 60% as large today as it was in the 1960s, when it peaked at over 340,000 people. That means the supply of housing is larger than demand, which, in turn, means low prices: the median home value in Birmingham is just $86,000 and median rents are about $520. Akron’s nickname, “Rubber Capital of the World,” recalls a past when it produced much of the country’s rubber tires. While many of the tire factories have since been shuttered, Akron has recently proved itself worthy of the name in a different sense—it’s ability to bounce back. Today it houses a multitude of R&D and tech offices, and its unemployment rate is half a percentage point lower than the national average. The state of Louisiana offers some of the lowest real estate tax rates in the country, and that trend helps make Shreveport one of the cheapest cities to live in. Despite a median home value of $124,700, higher than any of other top ten cheapest cities, the average monthly home payment is just $1,126 in Shreveport. Like most of the state of Texas, gas prices in Amarillo are typically lower than in the rest of the United States. As of March 2015, a gallon of gas in Amarillo was about 20 cents cheaper than the national average. That, combined with rents that are less than 80% the national average, make Amarillo a very affordable place to live. According to the U.S. Census, the median home value in Detroit is just $42,300—less than the median income for full-time, year-round workers in the U.S. However, while a home in Detroit can certainly be bought for cheap, it’s important to keep in mind the additional cost of restoring and renovating a home, which can often run in the tens of thousands of dollars. Tip: Looking for other ways to maximize your income? Consider meeting with a financial advisor.